It is difficult to determine the exact origin of playing cards. As early as the 7th century, the Chinese used paper cards corresponding to three different types of games: monetary cards, domino cards and cards representing Chinese chess pieces. The more likely scenario is that cards that appeared in Europe in the late 14th century came from the Middle East. Traces of a Mameluke game were discovered that were very close to an Italian game dating from the 12th or 13th century. Card games may well have been introduced to Europe through Spain which was then occupied by the Arabs or by Venetian and Lombard trade merchants as they travelled around the Mediterranean. The first playing cards were hand-illustrated by miniaturist painters and were often enhanced with fine gold. These would have been reserved for the aristocracy. Card games were quickly popularized however due to the development and progress of the printing press. 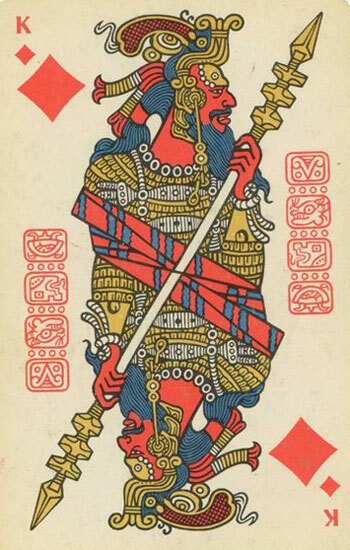 As early as the 15th century, Swiss and German printers produced playing cards in large quantities. Their success was such that the Church became concerned and decided to prohibit the use of playing cards. The number of cards and the face values represented on the cards swiftly became standardized. However the symbols used varied widely from country to country, over the centuries and depending on the origin of the cards.